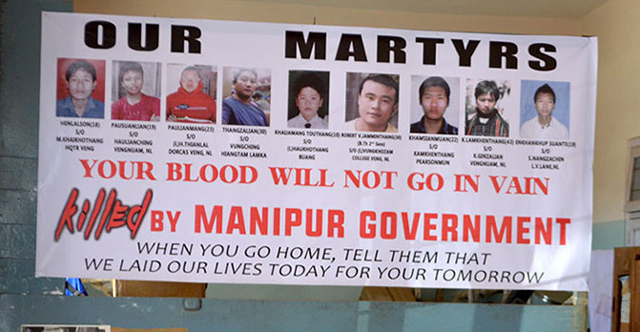 Outside the morgue at Manipurʹs Churachandpur District Hospital last week, mourners had gathered under a marquee. A woman addressed the crowd, talking about faith. They were mourning the nine people who had been shot by security forces in protests that broke out after the state government passed three contentious bills about residence rights and land ownership. That was two months ago, on September 1. Many of those killed were teenagers, the youngest only 11. But they are yet to be buried. In Manipurʹs tribal areas, custom dictates that family members keep vigil with the dead until they are buried. Local philanthropic organisations support the bereaved with money and other kinds of assistance. But in Churachandpur, a ritual that should have lasted a few days has stretched into months. Youth organisations from several tribes have come together to form a Joint Philanthropic Organisation, which has set up office at the district hospital, collecting over Rs 73 lakh in assistance for the families of the victims as well as for those injured and in hospital. Hundreds of visitors pour in every day to keep vigil with the relatives of the dead. In Churachandpur, a private bereavement has turned into a collective mourning, cutting across tribal divisions. The collective mourning has turned into an act of protest: withdraw the three bills or leave the stateʹs hills areas out of it, or we wonʹt bury our dead. As a consequence, Churachandpur town has become the epicentre of a new agitation that brings old faultlines into focus, between the hills and the valley, between the politically and numerically stronger Meitei people and the tribes that also inhabit the state, between the Manipur government and the autonomous district councils that are meant to govern the hill areas.